33rd Annual Business & Community Expo - presented by Worksite - "The Art of Business"
This year's Business & Community Expo will host business and community promoting their products and services, live demonstration, hands on children activities, food and drink, free give-a-ways. raffle prizes and much more. Win tickets to Tampa Bay Rays, Atlanta Braves, and on the Key West Express. 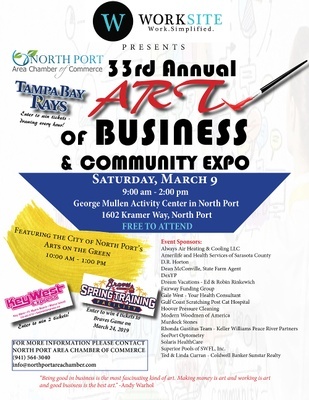 Vendor Booths and Sponsorships will be available through the North Port Area Chamber of Commerce.